_1050710, originally uploaded by nisuspi. As the sign says, there’s a set of photos up taken at Good Hope school near Simakakata, and all you need to do is click on the pic to see them. 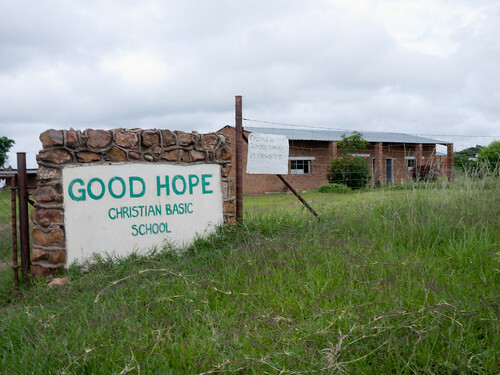 Good Hope is where George, the headmaster at Simakakata, used to work and where his wife, Linda, still does. It’s an amazing place – proof of what’s possible in development. Even further from the main road than Simakakata, it was started about 15 years ago by a Christian mission with German funding, and is now an incredible establishment for 7-15(ish) year olds. It’s remarkably well equipped, has running water and a brilliant staff. One day, Simakakata will look like this.